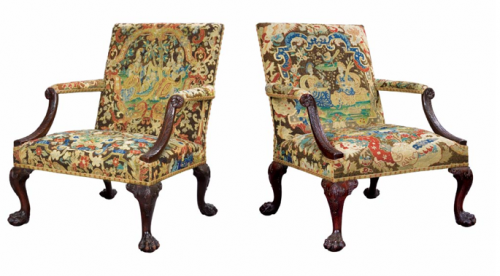 The featured item from the Joseph Patrick auction, these George II mahogany library chairs, sold to an English bidder for $164,500 (estimate $100,000 – $150,000)! 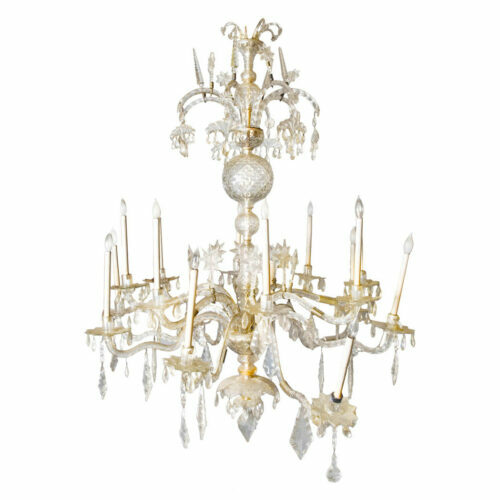 Another favorite, this George III chandelier had a final price of $35,000 when the estimate had been $15,000 – $20,000. This handsome George III Gilt-Bronze mounted mahogany library table, with an estimate of $10,000 – 15,000 sold for $80,500!! 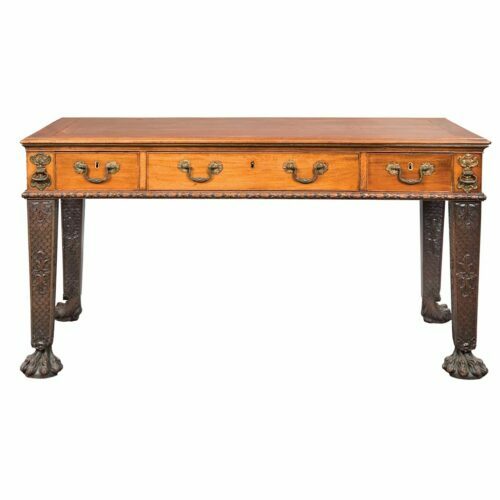 And the fabulous tric-trac table which we all recognized had quite a low estimate at $3,000 – 5,000, had a hammer price of $40,625. Now not everything went for over the estimates of course. 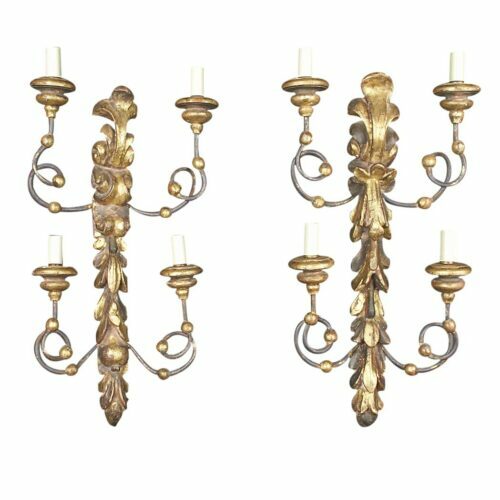 These fabulous sconces, with an estimate of $800 – $1,200 sold to some lucky buyer for a mere $688! What a deal!! But overall, it was a hugely successful auction and proves that Doyle’s acumen and pricing strategy was right on the money! But it’s not just at Doyle that auctions are reaping record prices. The art auction market is definitely recovering. Christie’s announced Thursday that it sold $5.25 billion of fine and decorative art last year. That’s a 53% increase over the previous year and even more than 2007. Take a look at this interesting video from the Wall Street Journal explaining this burgeoning phenomenon. With major auctions of modern and contemporary art coming up next month in London, it will be interesting to see if this trend continues. This entry posted in art, auctions, Christie's, furniture. Entry Tags: Christie's, Doyle New York Bookmark the permalink. I absolutely love Auctions- what a lovely post- and some wonderful pieces! Hi Zeanne – Thanks. I think auctions are a great way to buy. Fantastic…if that is a sign the economy is improving! What do you think? I think it is a sign that people are willing to part with their money for what they see as a good investment. Just wanted to pop over and say thank you for voting for me on “The Homies” :) Very much appreciated! Most welcome Slim – good luck! Gorgeous items. The math itself makes it seem like the market for these type of items is greatly improving. HI Kathleen – things are definitely improving for this end of the market – let’s see what happens next month in London. I love auctions but make sure you’re patient, I bid at Christies in London in December and still waiting for my lot to arrive…grrrr! AO – I’ve never bid for anything overseas. I’m sure you’re anxious to receive your piece – hopefully it comes soon! I wonder why this happened? The goods must have been exceptional to draw numbers above the estimates in this financial climate. My knowledge right now is that tons of stuff is hitting the market but no one has the cash to buy. Obviously this upper echelon market of folks with cash are buying the best that is out there. Great post. Hi Jane – this end of the market has been improving – with retail as well. Let’s hope it trickles down. TEH – Yes exactly. I’ve not been terribly lucky either but clearly there were some good deals here. Hindsight is wonderful! Hi Mary – Yes, that video was interesting right? I think people are looking at these pieces as investments as well as just beautiful objects. I feel the same way about the sconces – LOVED them! Hi Maureen – I’m cautiously hoping the same. I’m always intrigued to see what people are buying, so this was a fun post for me. I’m hopeful that the economy is turning, and it would be awesome to have a client with a budget to purchase any of these pieces! Lovely! Hi Sally – Yes, I’m always interested as well. Obviously these were some very high end clients – but clearly they’re out there. Love the chairs, library table and of course the chandeliers! Have agreat day, and enjoy your movie. Hi Teresa – Nice to see that Doyle played this correctly. Hi Marsha – Aren’t the chairs fabulous?! I think they are feeling more comfortable for whatever reason but also looking at these special pieces as investments. Hi Dawn – Yes, the luxury market has definitely picked up. Love auctions – what great items! Hi Kate – Yes, this auction had some really beautiful things. 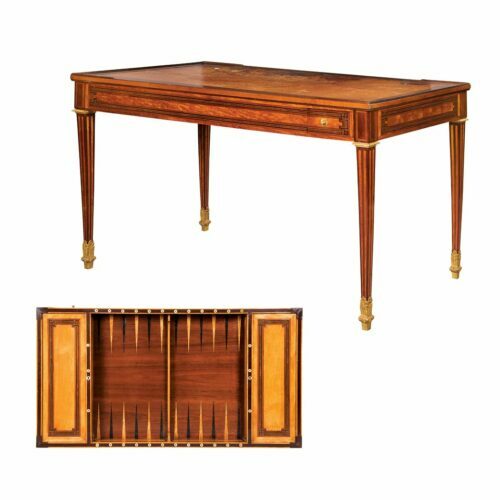 Love auctions and these are some really beautiful pieces. I along with the rest of the world am very ready to see the economy improve. Crossing my fingers that this is a sign of good things to come. Hi Mona – I think we all are. My fingers crossed as well. One of these days I’m going to live somewhere with that chandelier. Hi Lisa – too funny – you never know – it could always come up again! What a wonderful post, it is always nice to see a prices realized follow-up after a preview, you are the only writer/blogger I can think of who has done this. We subscribe to the Journal, it was nice to see the story about higher prices at auctions of this level. Hopefully it signals a healthier economy, we are crossing our fingers that is the ultimate outcome. May the rest of your weekend be splendid! TPP – Well thank you! It’s so much more interesting to know what happened in the end – and that’s how we learn! I thought the Journal video was interesting. Let’s hope the spending trickles down a bit. Most retailers I’ve spoken with say things are definitely better but not where they were. Yes, we keep hearing down in Texas that the east coast is beginning to rebound from the recession. It seems a bit slower here, we had a later recession than most of the country. Glad to hear this news! Hi Carla – Yes, it is definitely better up here – not good, but better. And the luxury market is making great strides. My son has been Lego obsessed for years too. The Lego exhibits at DisneyWorld are wonderful. Looks like we are in similar stages of life. I am on the college search end with one and still in Legoland with the other! The Harry Potter sets were the best! Me too – and in addition – have one already out of college applying to law school! I live right down the block from Doyle. They have some marvelous things! Stacy – Lucky you!! I love Doyle – especially the At Home auctions! 82 queries in 0.473 seconds.